We've been a better road team than home team in recent years. We're 5-7 in our last 12 home games, 9-5 on the road. We've weirdly become a better road team. Losing the #1 DVOA defense for four years may something to do with it. Plus Wilson was better before than he is now. It’s a very odd thing. I can’t wrap my mind around it. This team has always been dominant at home regardless of if it was Hasselbeck throwing to Darrell Jackson and Holmgren on the sidelines or Russell throwing to Doug Baldwin with Pete Carroll on the sidelines. It’s more than stats. It’s just unexplainable. The 12s are still doing their part so what gives? Defense was almost always a guarantee and giving up over 20 points was basically unheard of, at home or on the road. Easy to be dominant when opposing QBs struggling to throw for 150 yards. Will take some time getting the new guys up to that level. Yeah it's just not loud like it used to be. Now it's just like every other stadium. Not impressed yesteday , I've never seen that many fans sitting down and not making noise ... Its not as loud as it used to be for sure . Its more on the team even though crowd noise does help obviously. Seattle is definitely home field advantage. The team isnt as good. Itll change when we get more experience imo. Yes i have been saying it for a while. The day u guys let Kansas city hold on to the record for loudest stadium noise is the day the mystique left. And how many games do you go to a year? Where do you sit? Did you stand and yell all game? If you aren't a STH and aren't there for most games you really have no clue. There's always games where the noise and crowd enthusiasm varies. When the offence puts on a crap show, it's always more subdued. When he offence is hitting its stride and the defense is getting turnovers the crowd really gets into it. Always been that way. And the fans can sense the necessity of the match. Playoffs and division games get more people out of their seat. And different sections behave differently. Lower bowl guys tend to stand more than upper bowl fans. Club seat fans sit more than non-club seaters. Always been that way. And honestly as long as the crowd is energetic enough to cause the opposition to go to silent counts and hand signals, there's not much more you can do. I think the problem is that the teams coming in are far more prepared for the volume, have their hand signals down and have to really focus. They are less flustered than the old days. Everyone knows its coming. Now all we seem to be doing is disrupting our defensive communication. IT's sad to see that HFA go downhill so much the last couple years. But it's frustrating as a fan that yells and stands on D every time the D is on the field. After a while you wonder if you are doing any good any more. 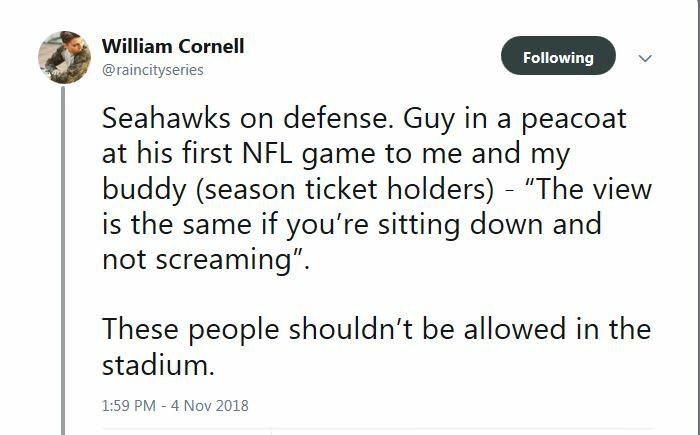 The stadium is still really loud (compared to most stadiums) but I often see people standing and cheering when the Hawks are on offense, or just sitting on their tails on crucial plays on defense which seems puzzling to me. Scrolling through Twitter after the game on my way home yesterday I came across this gem. Im seeing more and more of these types of fans at the game. Aros wrote: It’s a very odd thing. I can’t wrap my mind around it. This team has always been dominant at home regardless of if it was Hasselbeck throwing to Darrell Jackson and Holmgren on the sidelines or Russell throwing to Doug Baldwin with Pete Carroll on the sidelines. It’s more than stats. It’s just unexplainable. The 12s are still doing their part so what gives? What gives is NFL coaches and coordinators now have helmet mics to talk to their QB and complicated versatile hand signals implemented to deal with crowd noise. So the days of leading the league in false starts for the opposition teams and creating that HFA are pretty much over. Doesn't mean the CLINK isn't still a great HFA, it certainly is, but IMO it was never a "mystique".............it was just a REALLY good advantage to have over our opponent's offense being able to disrupt playcalling and how their offense operated wih 64k people screaming for the entire game. The fans and the field have lost nothing. Pete and his Seahawks however clearly have. All good things must come to an end. The only question is for how long and who brings it back? Seymour wrote: The fans and the field have lost nothing. Pete and his Seahawks however clearly have. Are you really that down on what Pete's doing? I think we're on the right track, we just don't have the depth or talent level right now to overcome mistakes and our best players going down against good teams. I still have faith that we're going in the right direction, just might take another year or two to restock the roster with quality starters and depth. That's what I saw yesterday.........if you want to beat a good team like the Chargers at home, Russell had to be as good or better than Rivers (he wasn't), and we couldn't have our best players going down (Carson/McDougald/Fluker). Also something no one's said yet that I've seen, but Wagner had a terrible game. He's suppose to be the lightning rod out there on defense making plays all over the field, and he looked slow and even injured. Just can't have that against an elite back and QB like Rivers who will pick you apart if you're zone players aren't quickly filling gaps and zones. The crowd noise used to be unique to Seattle and it isn't anymore. All teams now prepare for loud stadiums so really we can scream all we want I don't believe it makes any difference anymore. It used to. Probably a hard truth for many but if you take emotion out of it am I wrong? Without that advantage, the better team wins regardless and yesterday the better team won. I'm answering the question. Have we lost our HFA? Like it or not, the answer is clearly yes. And it's not the fans. What does that leave? Yes, we are on track. Again, I'm answering the question. Look guys, the Seahawks became consistently good in the early part of this decade. Seattle is a very trendy city with a lot of money. Seahawk games are no longer overwhelming populated with rabid, diehard football fans as they once were. Today, and in recent years the seats are flooded with folks who are doing the cool "thing" to do on a Sunday around here. This is a social event for many. This is a thing to take a selfie at and show all your "followers" the cool thing you were doing on Sunday. Seattle grew a reputation for the 12th Man and lots of trendy people in this area want to be a part of it. Take a look around you next game and note all the people gabbing to each other during critical parts of the game, or with their faces locked into their device and paying little attention to what's happening on the field. This is particularly true in the club sections. I don't think we've lost it, we clearly still play better at home than we do on the road, especially the defense that still gets an edge with the pass rush. It's just not as pronounced as it used be because of the things I mentioned about (QB helmet mic/hand signals and other ways to combat crowd noise). I was just disputing the word "mystique." I don't think it was ever an mystique, just a VERY REAL tangible advantage due to the stadium and crowd noise...........that's unfortunately mostly gone. Sorry but that is just plain an ignorant post!! Your sample size is a little small don't you think? Since the SB loss to the Patriots we're 15-12 on the road and 17-10 at home. (not counting Arizona tie or win in London). So yeah, I'll rescind my "clearly" part of better at home, but our record is still better over the past 3 1/2 years at home. Certainly not the dominating 7-1 or 8-0 home record dominance of old, but also not just flat out terrible. Why? It's pretty clear isn't it? We're just not a very good team anymore, and not very good teams lose as much as they win at home. Sample size is too small for you?? What the??? 12 games is a year and a half+ of football for crying out loud and we are FAR better on the road! Lost cause. Doesn't matter what you say here. We have clearly lost the strong HFA we once had. Accept it or deny it, I don't care. It goes well beyond that though. This thread is weird that people don't see what is being stated here. That is not just a poor team. That is PLAYING FAR WORSE at home!! Seymour wrote: Sample size is too small for you?? What the??? I accept it because we're not a dominant team anymore.......but sorry, I'm not accepting that there is some mythical "mystique" that's vanished. We didn't have to be good to have noise before, but one thing we do need is a electrifying play to get people excited, big hit, big run take away, great catch etc. Looking uninspired or flat doesn't help that cause, refs taking the game away from player control is worse. The D back in the day was the #1 reason we had such a home field advantage. This season our D is surprisingly good but not the terrifying monster it was back then. Doesn't mystique mean mystery or mystical ? I think this is pretty telling because Rivers was EXPECTING it to be loud and it didn't live up to his expectations. I'm not sure if he was comparing it to exhibition games too but most likely he was because the last times he played in Seattle for regular season games was 2010 and 2006. Stats in a vacuum. Got to love it. Are we considering quality of competition? No. Injury status of key personnel? No. Staff and personnel changes during that time? No. Any context whatsoever? No. Statistics out of context are completely meaningless. This year with the corrections we have made in staff and the additions/subtractions of players, we have lost twice at home. Once to the Rams, who are tipped to be the NFC Super Bowl representative and have only lost to New Orleans on the road, and once to the Chargers, who are in the AFC contenders conversation and have been a bugbear team for the Seahawks for ages. We had a chance to win both games. It also may be worth noting that *we have only played 3 homes games this year*. Our schedule has additional very tough home games this year, slightly mitigated by the fact that some are in prime time, but otherwise really challenging teams. The Packers have a decent QB, the Vikings have a strong defense led by an aggressive front, and the Chiefs are tipped to be the ACF Super Bowl representative. So it's entirely possible that we may lose more at home this year. But keep it in perspective - those are tough teams to play anywhere, while we're half a season into a new rebuild/reload/refurbishment with new OC and DC. It is beyond bizarre to have folks in here being all like "The fans aren't as loud thus we don't have home field advantage like we used to" when there was a nearly blinding stimulus to generate that noise, namely dominant defensive football. For two years the defense hasn't been those guys so asking fans over 16 games to give it their all with their vocal chords and have it not matter much (even perceptively to fans themselves)...why would expect fans to do their rain making dance as the drought continues. Oh sure, the fan demographics have changed and there's just a bunch of peacoat clad lads who are reading Proust during the game...but cmon, fans, not just Hawks fans, bring it when there is constant validation of their collective fan efforts. That we brought it just that much more when we had an exciting and dominant defense on the field is really cool but to expect that level of unrewarded fervor to continue...cmon. Unwavering enthusiasm is a great ideal to strive for but it's like the gottdang Seahawks running game - When it doesn't work what else do you have? Not much? Other then Wilson who not on this board knows any of the players ? Lynch, Sherman and Kam made reputations and were in the media a lot. Right now were almost faceless other then Wilson for star power and draw. mrt144 wrote: It is beyond bizarre to have folks in here being all like "The fans aren't as loud thus we don't have home field advantage like we used to" when there was a nearly blinding stimulus to generate that noise, namely dominant defensive football. The stadium was loud even before we had a great defense or team. Seriously, we never used to care what our record was or how good the team was because we felt as a fanbase it was our duty to scream our way to 6-8 wins at home every season. I'm not saying the stadium isn't loud anymore, but it's definitely not what it was from 2003-2014. This is a fan base that set a world record screaming 137.6 decibels in 2013, against the Chargers last week we were struggling to put up 115. I am very doubtful that the Mora year was that loud. Can you remember The BeastQuake Run? We fans moved the earth!!! I doubt that the stadium has been that loud this year. There was no doubt that no team in the NFL wanted to play in Seattle that year. Yes....I see more "seat warmers" every year.....kinda sad, isn't it? You'd actually be surprised. A lot of us felt like Holmgren's last year was an injury-plagued fluke of a season and that the team still had the pieces to be a playoff team. I think we blew out the 49ers or Rams in the first game of the season and it was as loud as ever. If I remember correctly that was the year with the neon green jerseys where our fullback busted open his head against his helmet in pregame against the Jags? We blew them out as well and that game was as wild as I can remember any game being... Seriously, I remember walking out of the tunnels thinking that our 3-4 (or whatever) Seahawks had finally turned the corner lol. Ultimately, Mora's season turned sour and I'm sure the fervor died down a little bit as the blowouts continued to mount. But, that was a bad team that still won 5 games and 4 of those 5 games were at home. With all due respect, did some of you only start watching the Seahawks in 2012? Even from a distance? Even in our 2010 7-9 season, the Seahawks had a 5-3 record at home, "Qwest Field" as it was called back then. We had some bad losses in the 3 we dropped, but it was still immensely difficult to play here. Do I have an answer for why our home-field advantage has dropped? No. Demographic changes maybe? Fans who are loud but not rabid, more blue collar, and passionate? Again I don't know, but SOMETHING has changed. Stop talking about the talent on our team when coming to Seattle for over a decade was considered to be a dreadful road game by MOST teams. The noise was unbearable. It's still loud, the energy is still good enough. But it's no longer at an amazing level. Scorpion05 wrote: With all due respect, did some of you only start watching the Seahawks in 2012? Even from a distance? Maybe Hawks fans have a longer refractory period? Absolutely. I've been a season ticket holder since 2009. The crowd really started making a noticeable difference around 2010-2011. I sell about a third of my tickets every year because I simply can't go to every game and this past two years has been brutal. The last 6 games I've personally been to the team is 1-5. 5 in a row going currently. Absolutely brutal what has happened to this teams Home field advantage. Now that I think about this more, this seems to lay bare the conceit of Hawks fans thinking they were a huge reason for the home record.